When it comes to cozies, Christmas mysteries are some of the most popular books to read, especially around the times the holidays are nearing with big steps. Sure you can find non-cozies among these at times as well, but they are for the most part a rarity, and with good reason. Christmas is a family holiday with children spending time and having fun with adults, eating cakes, singing Christmas carols and opening their gifts. It is a peaceful and joyful time where reading about murder should not an intense and negatively emotional experience. The whole atmosphere in the house is cozy, and reading books that are light, fluffy, without too much gore, is preferred for the most part by everyone. What I enjoy a lot to look at these days are the cozy book covers. They are cute, adorable and often really fun, bringing out a smile on your face – whether you like cozies or not (and what is not to like about cozies? Often people say it’s akin to not liking puppies, and I definitely agree). 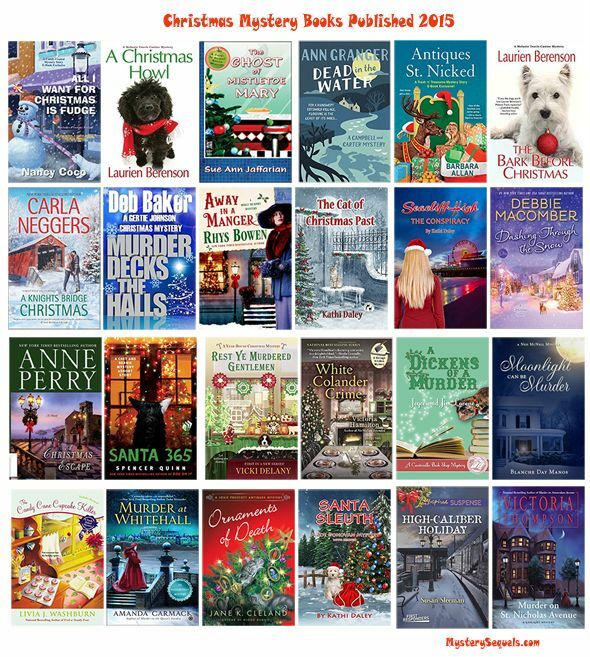 Here are the Christmas mystery books published in 2015. I think you will enjoy many of these. The winner with the most Christmas mysteries released this year is Kathi Daley, with 3 books under her belt, one in each of the series. Second place takes Laurien Berenson with two books (both in the same series). I have listed the books in order of publication from the oldest release to the newest one. Have fun reading!